The Philippines is set to shut its most famous holiday island of Boracay for six months, after the President described it as a "cesspool". President Rodrigo Duterte approved the temporary closure of Boracay after declaring that the ocean near its famed beaches was being polluted with raw sewage. The close will commence on 26 April, his spokesman confirmed. It has not been outlined what exactly will be done during the clean-up, however. Last year, around two million tourists visited Boracay, which is renowned for its white sand beaches and nightlife culture. Thousands rely on the tourism industry, which is worth around $1bn (£710m) to the national economy. Reports suggest disaster funds would be activated to help affected workers, but business leaders have urged the government to phase in the plans more slowly. Jose Clemente, president of the Tourism Congress of the Philippines, has described the industry as "quite depressed at the moment". Some local business owners have expressed concern over how they will survive without an income. "I really feel for the people in Boracay. They really need to find ways to be employed, or at least keep their head above water for the next six months," Mr Clemente said. In February, the fiery president criticised the resort's 500 hotel owners and restaurateurs, accusing them of dumping sewage in the sea. "You go into the water, it's smelly. Because it all [the sewage] comes out in Boracay," Mr Duterte said. The island's drainage system is sending untreated waste into the water, according to officials. A government study concluded that the sewage will turn Boracay into a "dead island" in less than a decade unless action is taken. The environment ministry says around 195 businesses and more than 4,000 residents are not connected to sewer lines. Last month, environment undersecretary Jonas Leones told reporters that shutting down the tourist trade may include suspending ferry services, making the beaches off limits, and stationing police there "if necessary". "An iron fist is needed to bring it back to its previous condition. It will be a temporary thing," Mr Leones said. Some airlines have already cut back their services since the closure's announcement. These include Cebu Pacific and Philippine Airlines. 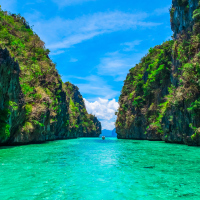 "We fully support the government's intention to make Boracay fully safe and environmentally friendly," said Jaime Bautista, president of Philippine Airlines. Before jetting off anywhere, get the insurance to cover your trip.